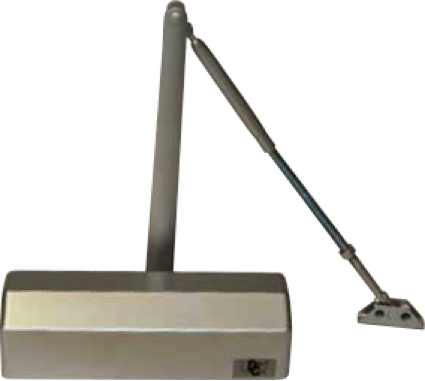 6000 Premium Surface Mounted Door Closer is for All Medium to High Traffic Commercial Storefront Door Applications. This Closer is built on a 9-1/16" Hole Pattern, Manufactured from High-Grade Aluminum, Packaged with All-Weather Fluid, Packaged with Parallel Arm Bracket, Wood/Metal Self Tapping Screws, Full Cover, Mounting Templates Included for Regular Arm, Top Jamb and Parallel Arm Mount, Allen Head Adjustment Valves. This Closer comes Standard with Power Adjustable Backcheck, Sweep, Latch, and 1-5 Spring Tension Valves. ANSI Rated A156.4, Grade 1, Certified UL Listed, ADA Compliant, Meets or Exceeds California Building Code Requirements for Minimal Foot Pounds of Pressure, Cycle Tested to Meet or Exceed 2 Million Cycle counts.